(1) Beat the whip cream. (2) Mix all the ingredients together. Put into a mixing bowl and double boil till mixture thickens. Cool before pouring onto cake. -(1) Spread 1/3 of the mousse on the first layer of sponge cake, lay the slice bananas on top and then top up with another layer or sponge, continue till the last layer of sponge is used up. 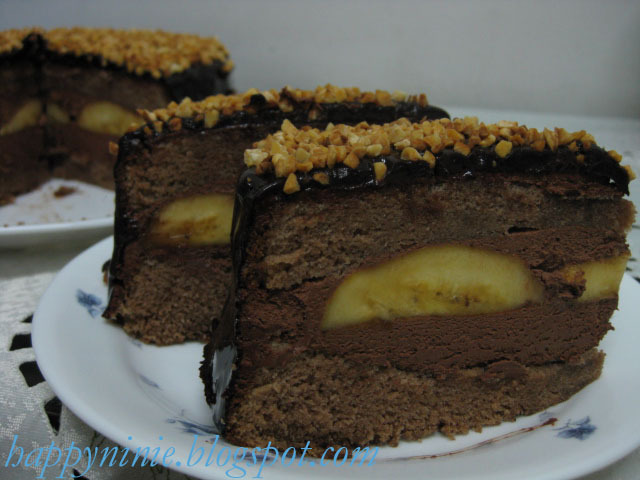 (2) Cover the whole cake with the balance mousse and keep in the refrigerator till the mousse sets. (3) Pour the coating onto the cake and let the chocolate mixture flows down the side smoothly. (4) Decorate the cake and put into the frige till coating sets. (5) Slice with a warm knife and serve. add: Saya gunakan non dairy whipping cream untuk resipi diatas .